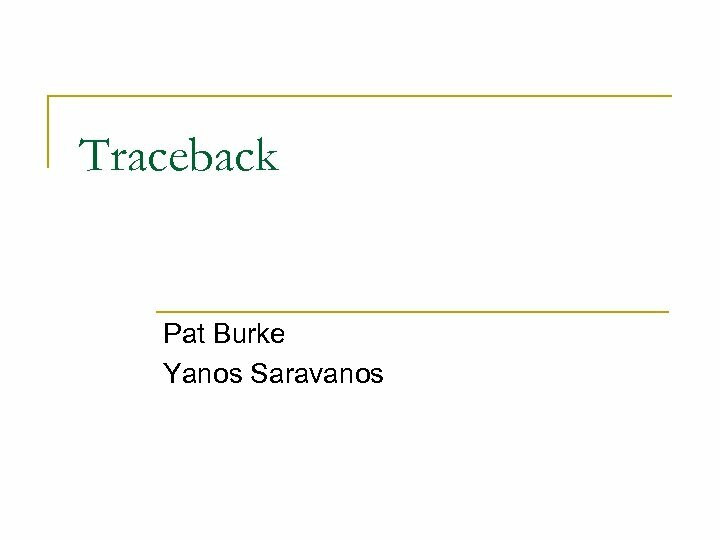 Why Use Traceback? 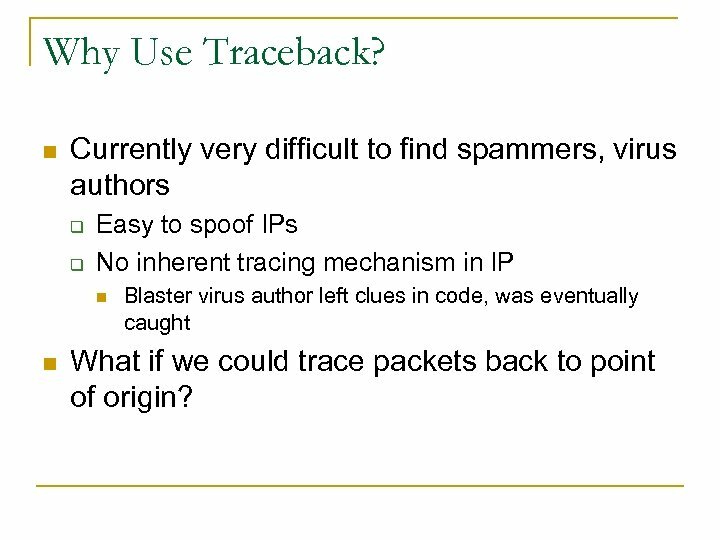 n Currently very difficult to find spammers, virus authors q q Easy to spoof IPs No inherent tracing mechanism in IP n n Blaster virus author left clues in code, was eventually caught What if we could trace packets back to point of origin? 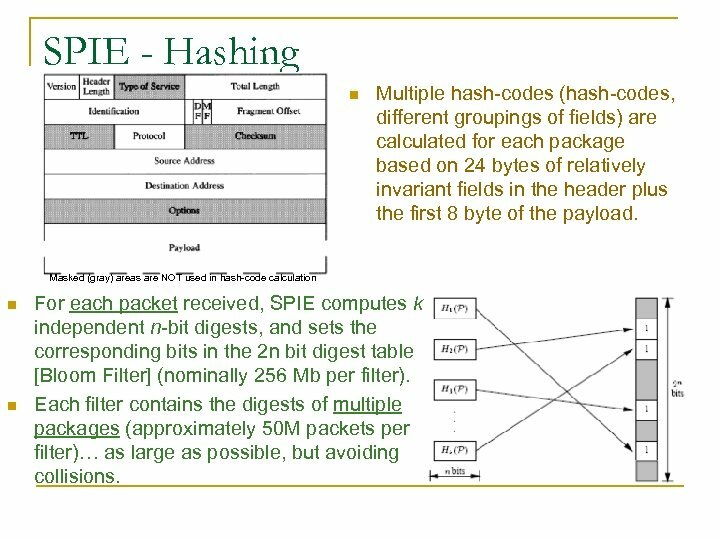 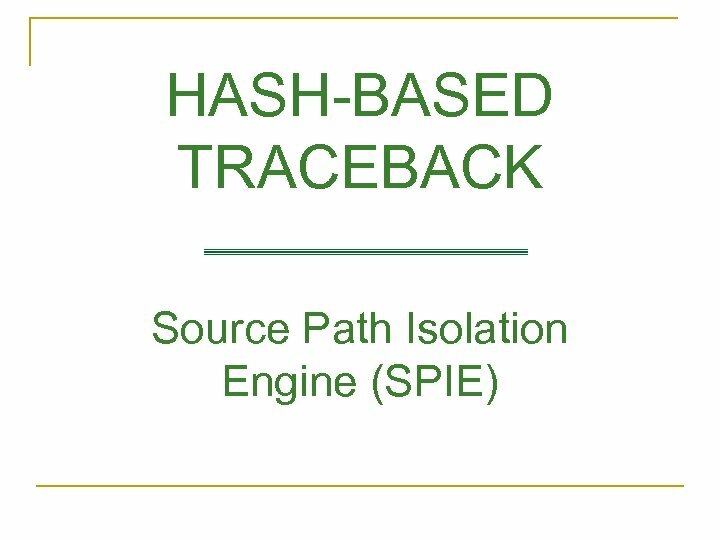 SPIE - Hashing n Multiple hash-codes (hash-codes, different groupings of fields) are calculated for each package based on 24 bytes of relatively invariant fields in the header plus the first 8 byte of the payload. 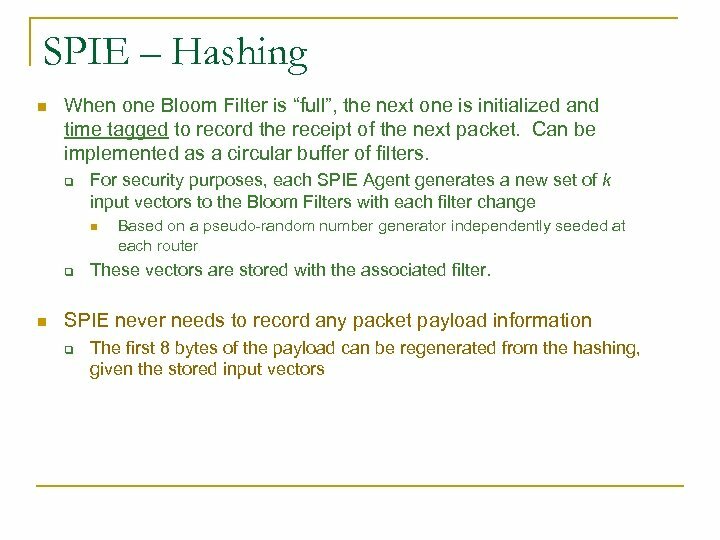 Masked (gray) areas are NOT used in hash-code calculation n n For each packet received, SPIE computes k independent n-bit digests, and sets the corresponding bits in the 2 n bit digest table [Bloom Filter] (nominally 256 Mb per filter). 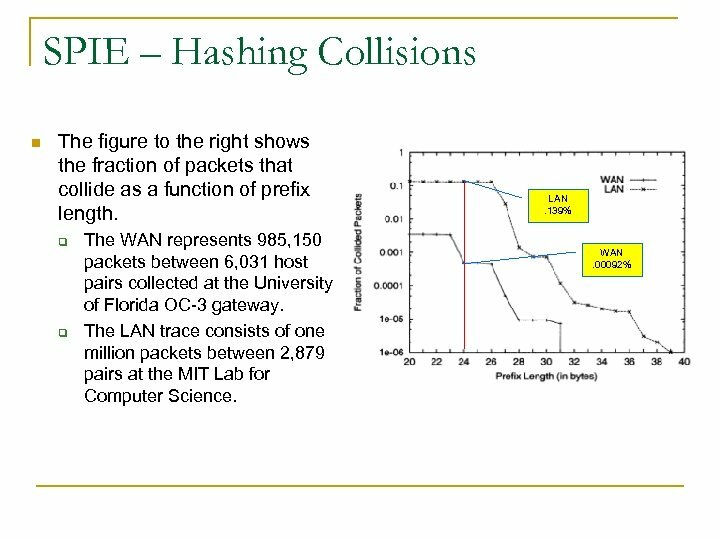 Each filter contains the digests of multiple packages (approximately 50 M packets per filter)… as large as possible, but avoiding collisions. 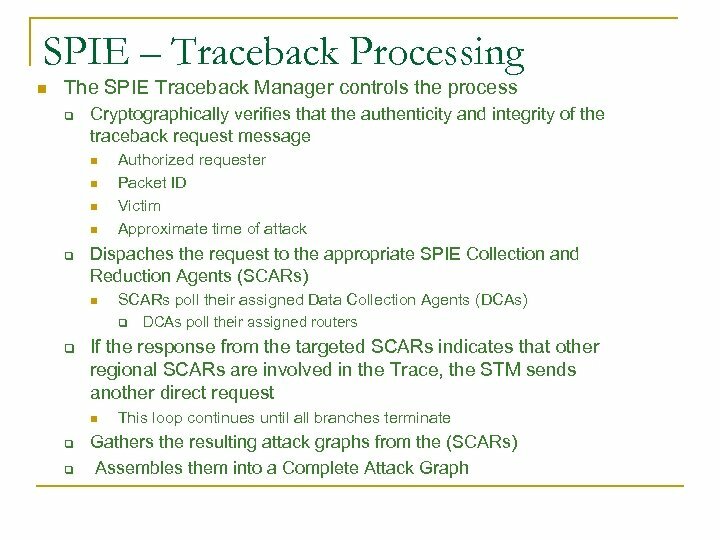 SPIE – Traceback Processing (Cont) n SPIE-enhanced routers hash the data received in the Traceback Request to determine whether or not the target message passes through the router q q Computes k digests using the appropriate input vectors Checks for a “ 1” in each of the corresponding K locations of the digest table “near” the target time n If ALL associated bits are set, it is highly likely that the packet was stored. 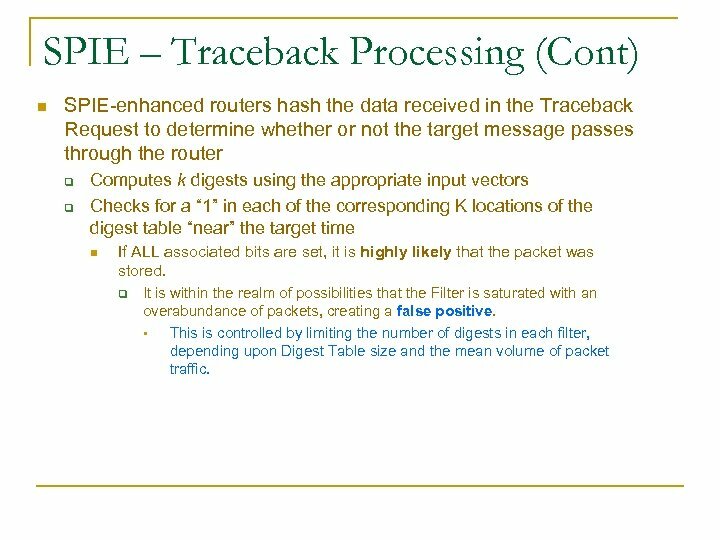 q It is within the realm of possibilities that the Filter is saturated with an overabundance of packets, creating a false positive. 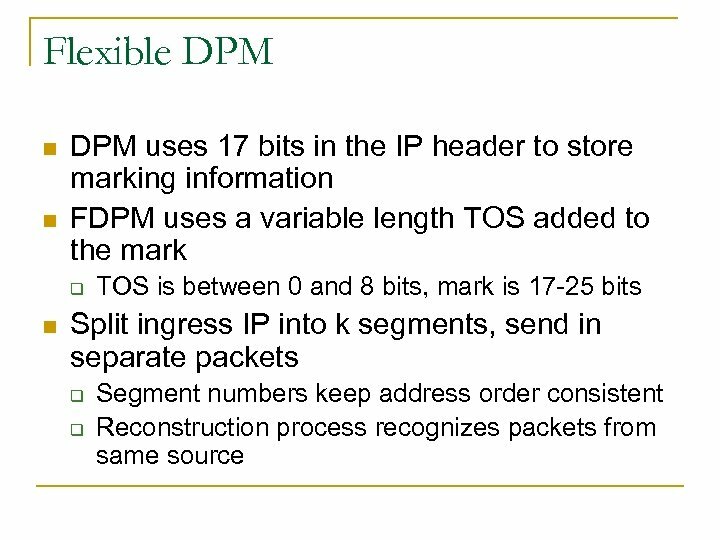 § This is controlled by limiting the number of digests in each filter, depending upon Digest Table size and the mean volume of packet traffic. 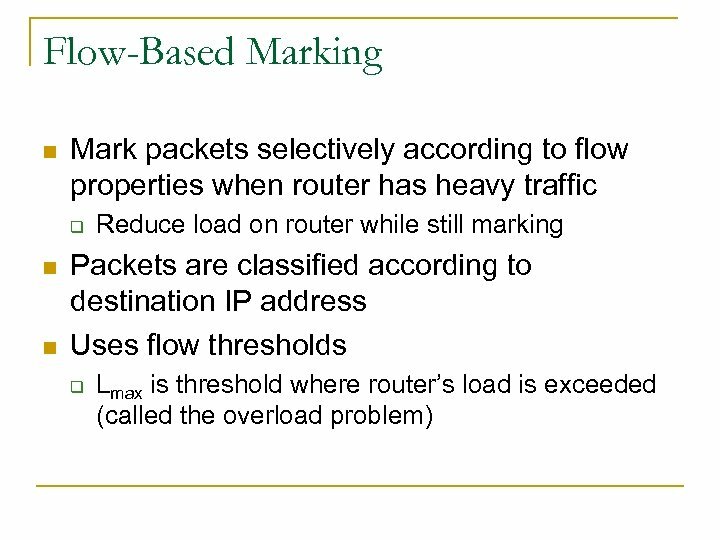 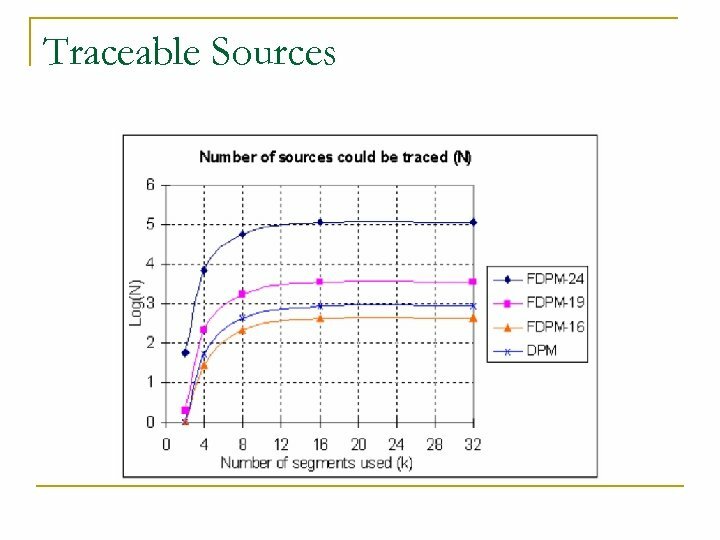 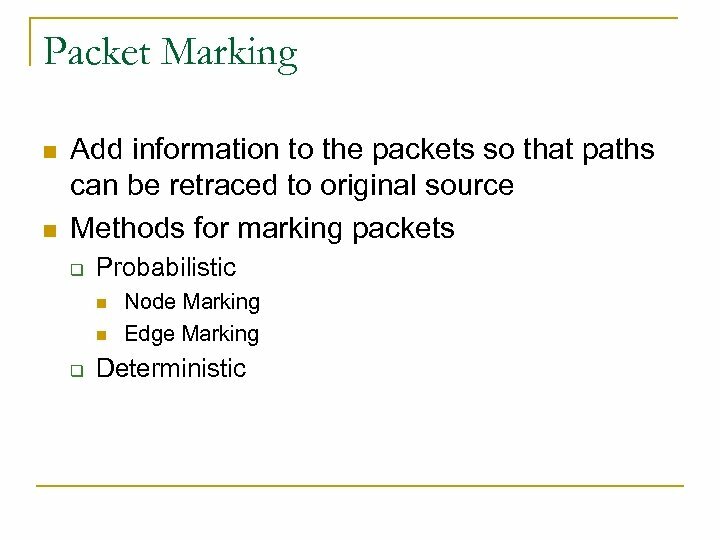 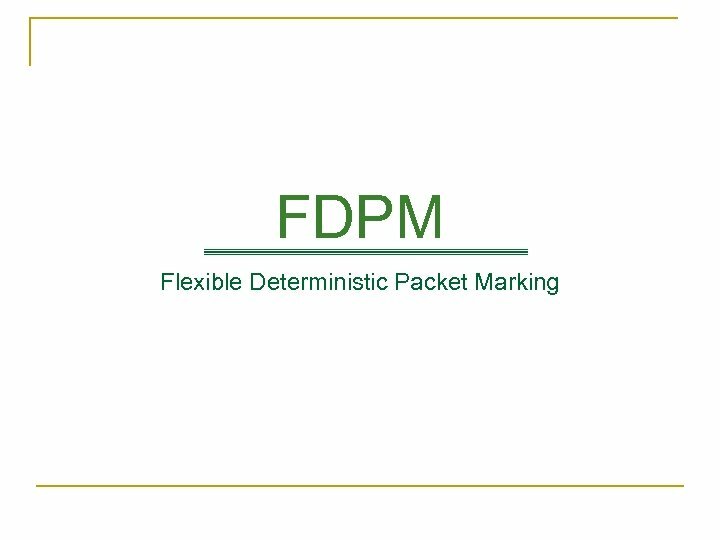 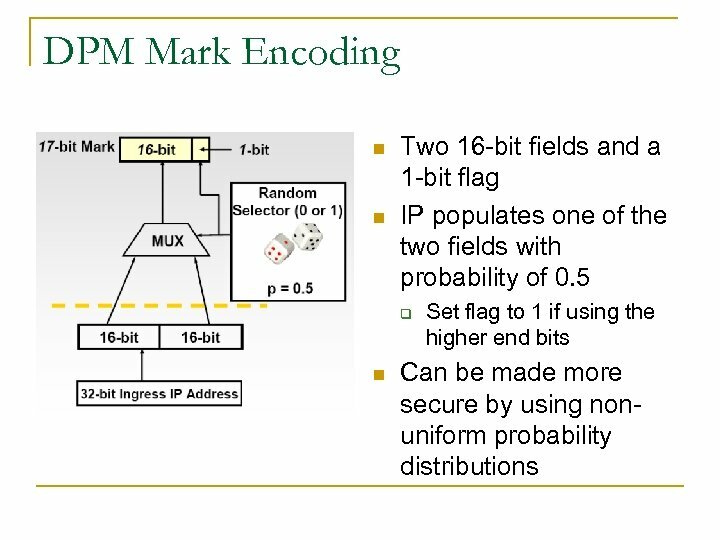 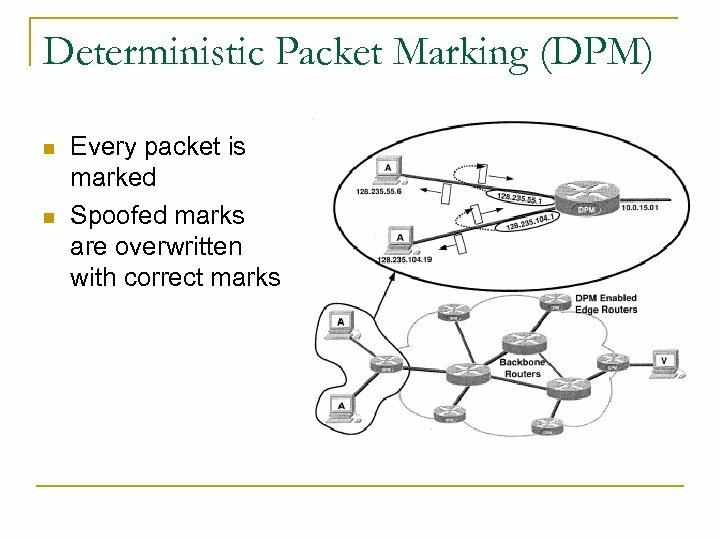 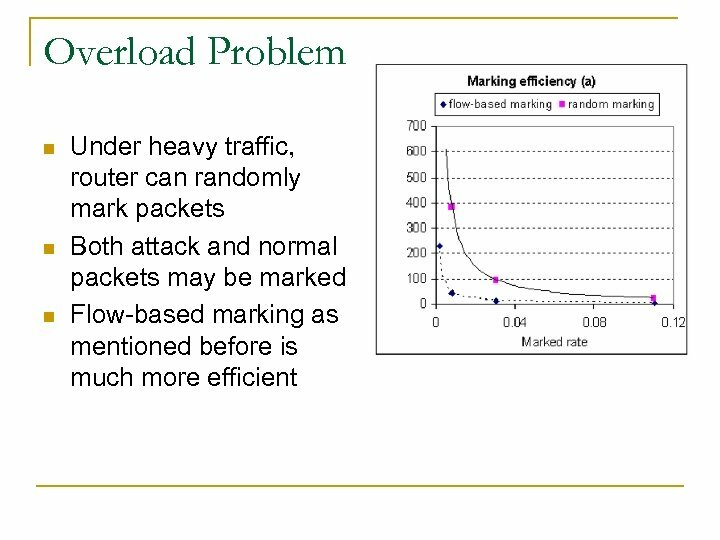 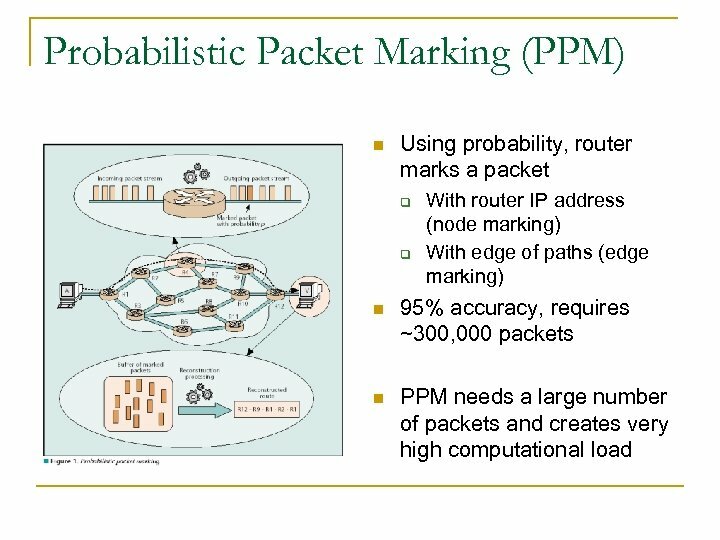 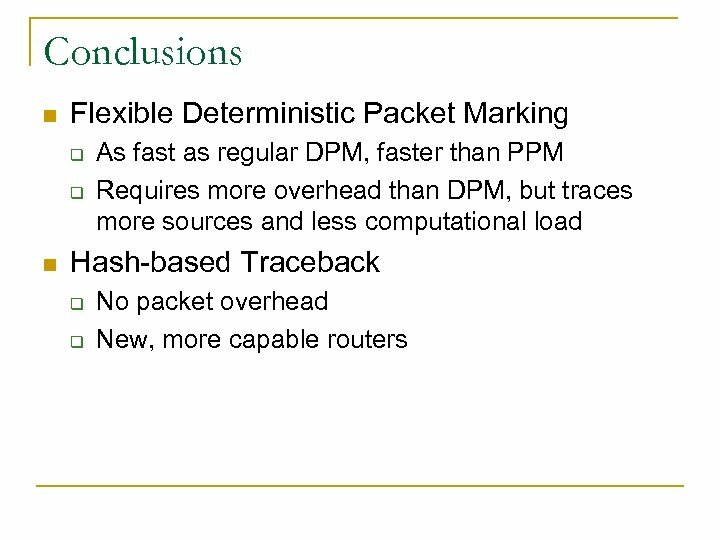 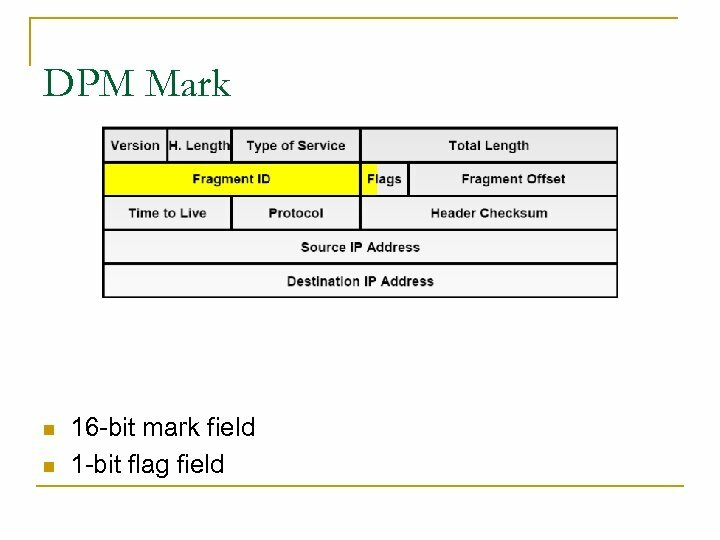 References n n Belenky, A. , Ansari, N. “IP Traceback with Deterministic Packet Marking”. 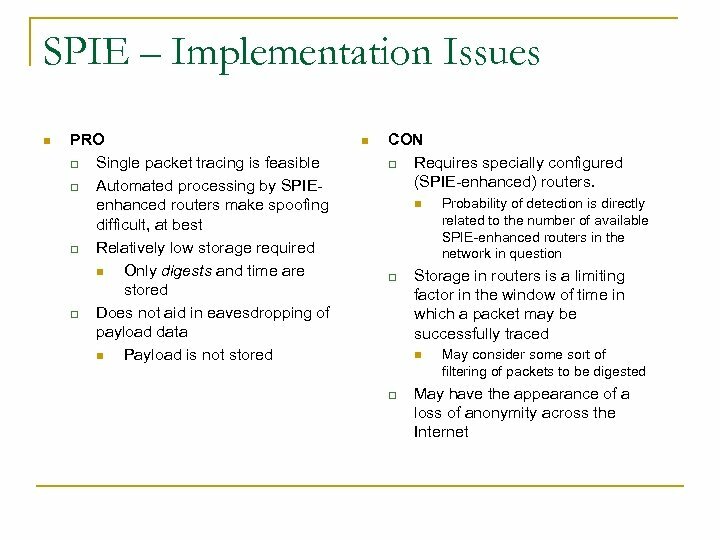 IEEE Communications Letter, April 2003. 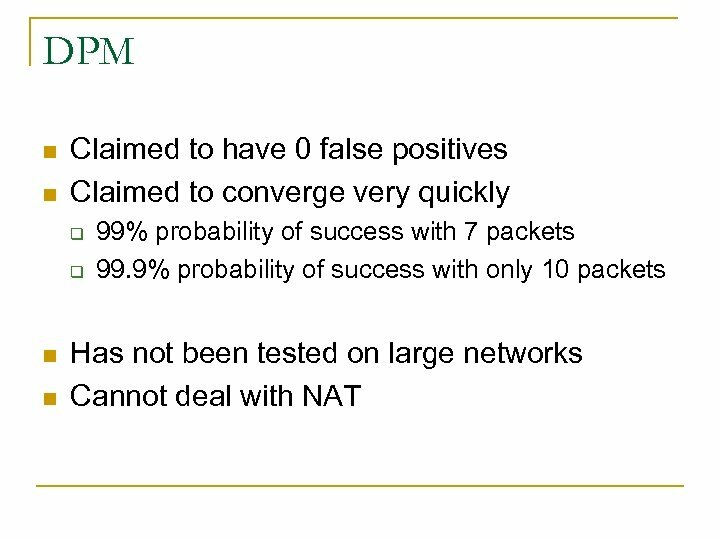 Savage, S. , et al. 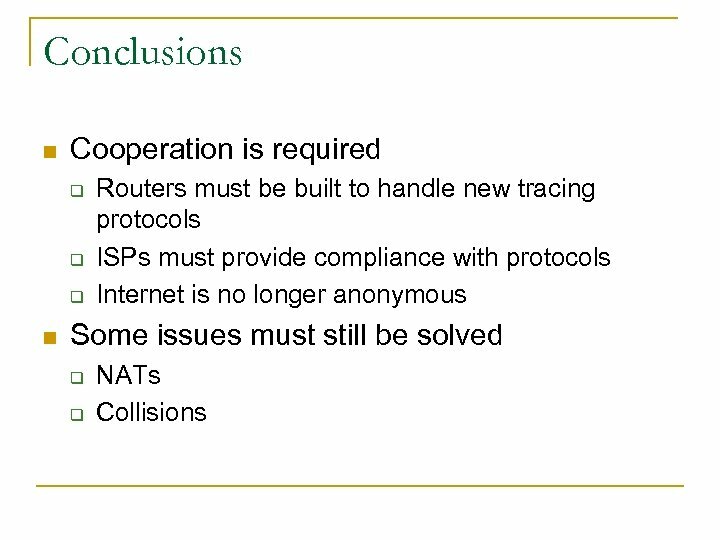 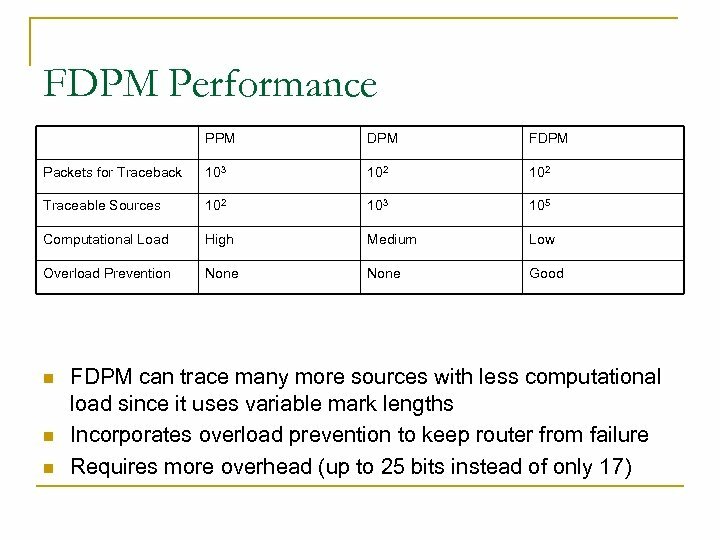 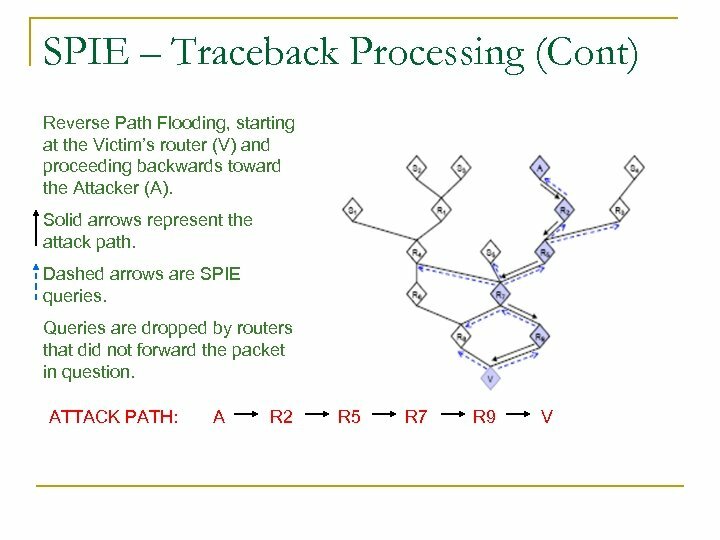 “Practical Network Support for IP Traceback”. 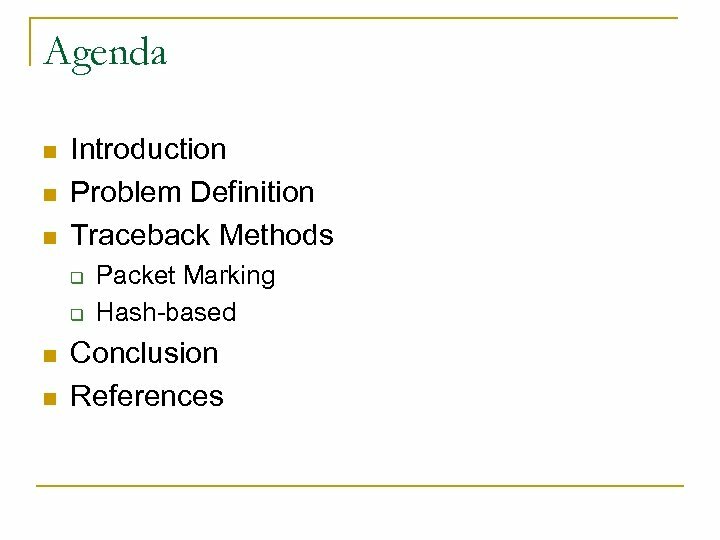 Department of Computer Science, University of Washington. 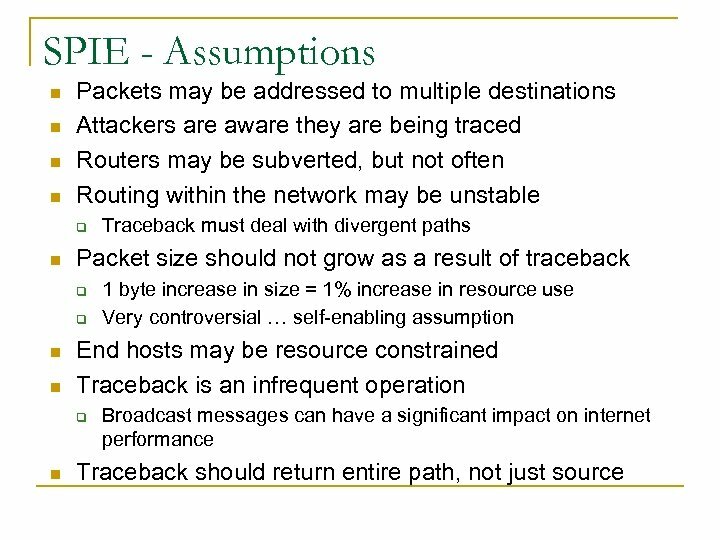 Snoeren, A. , Partridge, Craig, et al. 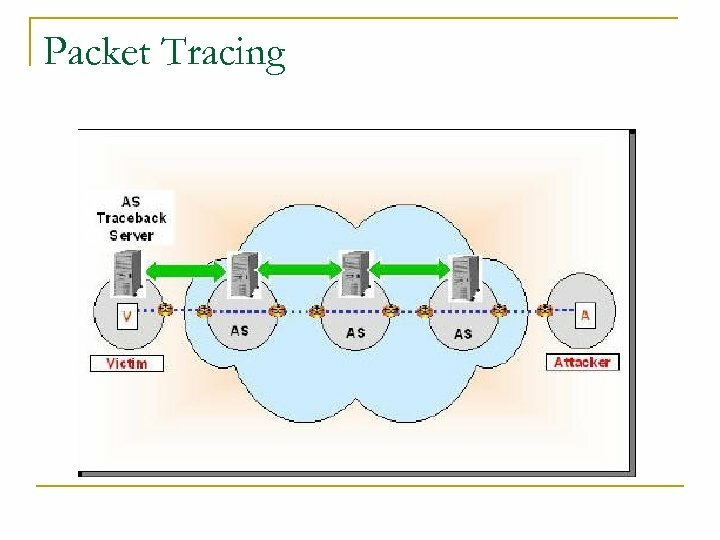 “Single-Packet IP Traceback”. 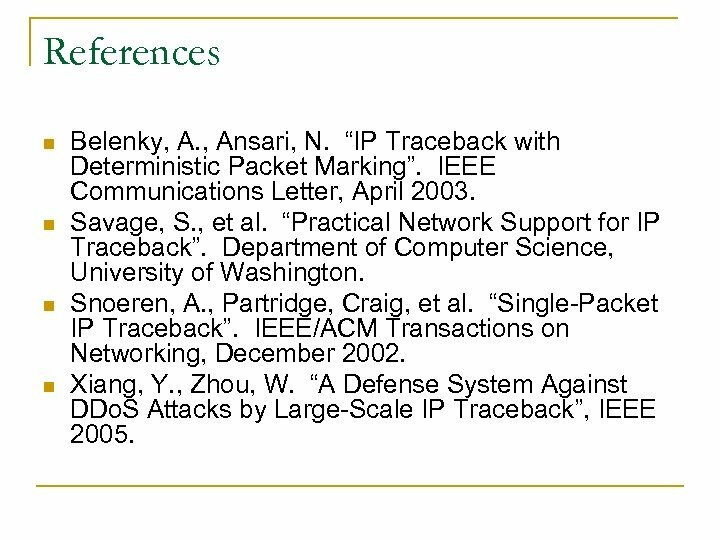 IEEE/ACM Transactions on Networking, December 2002. 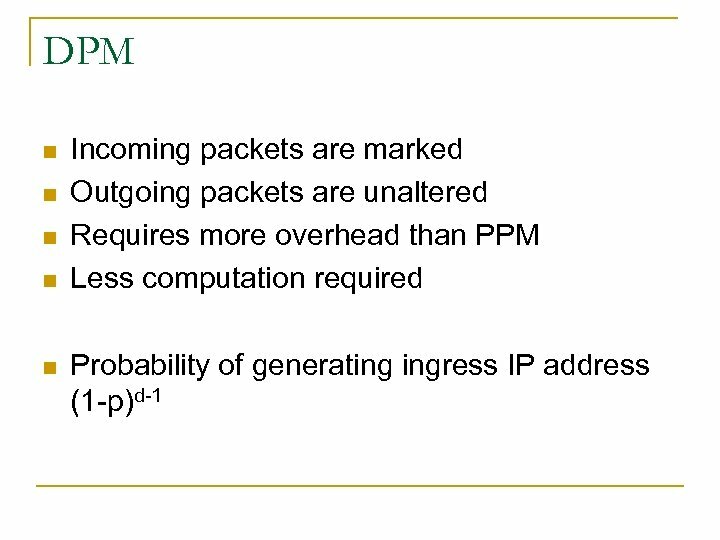 Xiang, Y. , Zhou, W. “A Defense System Against DDo. 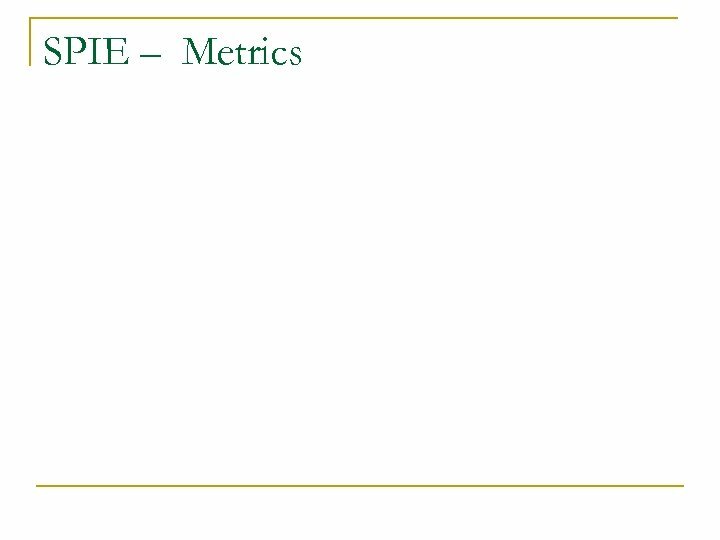 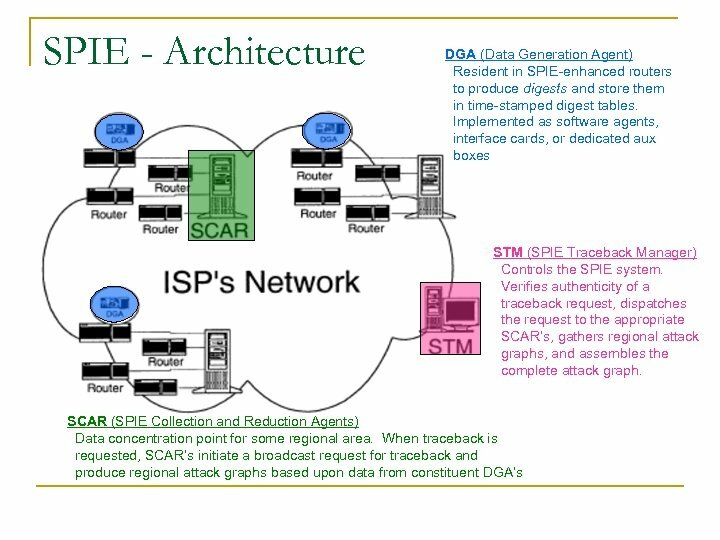 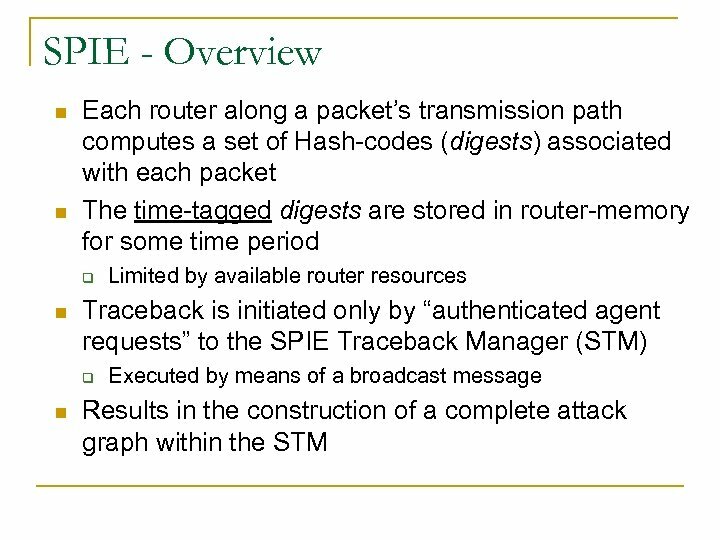 S Attacks by Large-Scale IP Traceback”, IEEE 2005.